When I am overwhelmed lead me to the rock that is higher than I. Psalm 61:2 David knew the solution to those times he had more on his plate than he could handle himself. In other words…Let go and let God! Many, and I do mean many, years ago a friend gave me this little snippet from one of her magazines. Never stop being encouraging even though you’re not getting any credit. 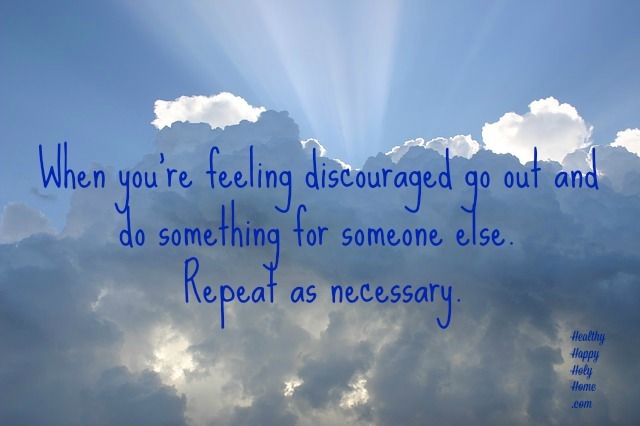 If discouragement is plaguing you try to identify the root of it. Is it about wants, needs, haves, have-nots… Is it about yourself, others, the world… Can you do anything about it? Does it require a change of behavior or attitude? Pray about it! God will lead you to the answer and the solution. He does not want His children to be fearful or discouraged. I find it interesting that the command ‘Do not fear’ is found 365 times in the Word. One for every day of the year. This entry was posted in Encouragement and tagged Do not fear, encouragement, overwhelmed, pray, Psalm 61 by Marie. Bookmark the permalink. I have always loved that quote, “Let go and Let God” Encouraging post! Thanks Kathleen! It’s something I have to remember every day. It’s not about me, it’s all about God!